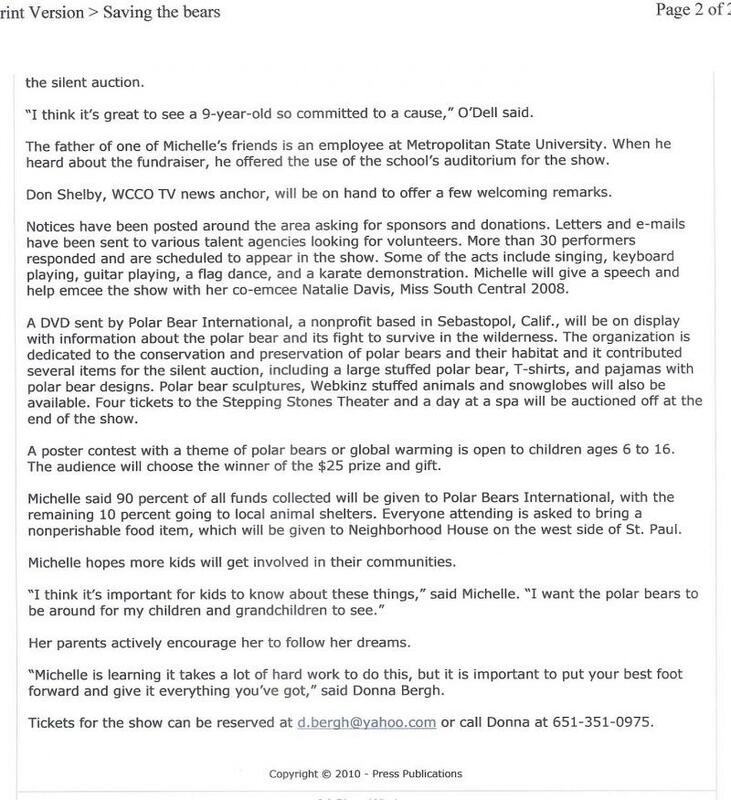 Michelle Bergh - Polar Bears Fundraiser in the news! When Holly O'Dell found out about my fundraiser, she loved the idea of helping the polar bears and she volunteered to personally get involved. She's the owner of O'Dell Communications and is a writer. In addition to getting some donations for the auctions, she also wrote a press release and sent it to the local newspapers and TV stations. She got me interviews with four papers, and the story was printed in the White Bear Press, the Stillwater Press, the Stillwater Gazette, St. Croix Valley Press and the St. Paul Pioneer Press. Then, the story Holly wrote got picked up by the Associated Press. From there, newspapers all over the world published the story! We were able to reach many more people and we got lots of donations from people who read the articles. Below are a few of the links to some of the stories. 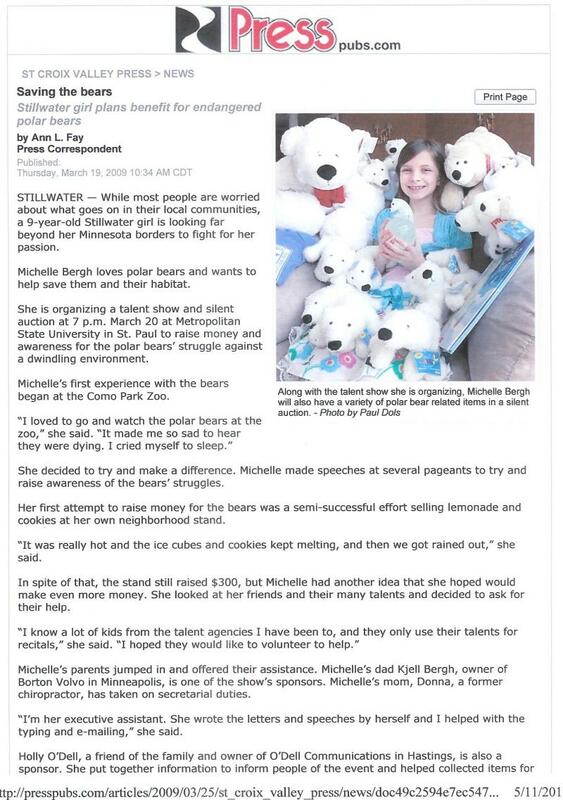 "After seeing a commercial about the plight of polar bears, a Stillwater 9-year-old began doing her part to save them. Michelle Bergh, a third-grader at the Minnesota Waldorf School in Maplewood, is planning a talent show for Friday night at Metro State University in St. Paul that will feature some of the best young talent in the Twin Cities. More than 200 tickets are already sold and two dozen acts are booked. the lineup includes singing, guitar playing, a Chinese flag dance and even a karate routine." Holly O'Dell sent the information to WCCO TV. Don Shelby, lead WCCO TV news anchor, heard about the fundraiser and volunteered to give opening remarks. He came with a camera crew, and it was featured on the 10:00 news. That night, I got to stay up late enough to watch it!